We look at the deep and long-standing relationship between Christmas and fantasy literature. Horror tales might take place near Halloween. Romantic comedies occasionally intersect with Valentine’s Day. And it’s not unusual for action movies to take place during the winter holiday season. However, it’s easy to overlook the deeply entrenched relationship between Christmas and fantasy literature. One could ascribe it to the general feeling of the magic of the holidays, or in some cases to the European tradition of telling ghost stories at Christmas. Whatever the case, there remains a strong association between the two, and we’ll look at six of the most famous instances in literature. This German story introduced us to what would become a multi-format holiday classic. Beginning on Christmas Eve, the original story introduces Marie, her inventor Godfather Drosselmeyer, the Nutcracker, and the seven-headed Mouse King. Over the years, the story would be adapted and changed (with Marie being renamed Clara in many other versions). The Three Musketeers author Alexander Dumas wrote his own version in 1844, and that particular take was adapted for the Tchaikovsky ballet. Most of the various versions include looks at the Doll Kingdom and the mouse society. The trope of toys coming to life would repeat in homages that are both obvious (like 1883’s Pinocchio) and less direct (Toy Story). We hardly need to explain this one to you, but there are a few details you might not know. For example, Dickens wrote an earlier story that can be seen as a dry run for A Christmas Carol. It was called “The Story of the Goblins Who Stole a Sexton.” Appearing in The Pickwick Papers in 1836, he told the story of goblins helping a church official named Gabriel Grub see the light of Christmas by showing him the past and future. The later version, influenced in part by the works of Washington Irving, the growing popularity of Christmas celebrations in England, and Dickens’s own awareness of the problems facing poor children, was immediately popular upon release and sold through a first printing in days. Carol has never been out of print since its release, and has been adapted for stage, radio, film, and television numerous times. Dickens himself did 128 public readings of the story in his life (only the first was the full thing; thereafter, he did shorter versions). Though he’s best known for creating the wonderful world of Oz, L. Frank Baum also wrote this well-loved book that served as the basis for the 1985 Rankin-Bass special. This one goes in interesting places, as it posits a baby Santa found by the immortal Ak, who would entrust his care to a lioness and wood nymph. Santa eventually invents toys, which angers the demons that make children misbehave; this leads to a war between the immortals and the demons and their monster allies. The Council of Immortals later debate on whether to add Santa to their ranks. Baum wrote a short story sequel called “A Kidnapped Santa Claus” that involves more demon chicanery. Christmas is rooted deeply in the heart of The Lion, The Witch, and The Wardrobe, the first book published in C.S. 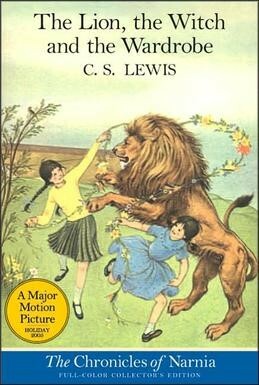 Lewis’s Chronicles of Narnia. Early on, the faun Mr. Tumnus reveals the threat of the White Witch, who is determined to make it “always winter, but never Christmas” in the fantasy land. Of course, the story relies on religious iconography, with Aslan representing a Christ-like figure. Despite those occasionally serious overtones, there’s still room for an appearance by Santa himself, or rather, Father Christmas. At a critical point in the plot, as Aslan’s return is disrupting the Witch’s plans, Father Christmas pays a visit to the child heroes of the story, gifting them with weapons that they’ll be able to use to fight the Witch’s army. The second novel in Cooper’s Dark is Rising Sequence introduces Will Stanton, who will become the primary protagonist of the overall story. On his eleventh birthday, Stanton, the seventh son of a seventh son, discovers his magical destiny as an Old One of the Light, beings that battle the evil of the Dark. This plays out against the backdrop of a Welsh winter, as the “twelve days of Christmas” will be the time that the Dark is rising. A number of Welsh and English Christmas traditions are referenced and incorporated into the story, including a sequence of time travel that allows Will to witness a Yule feast of centuries past. Though nothing overtly magical is ever suggested about the holiday in the Harry Potter series, Christmas itself plays a role in each of the seven books. There’s a bit of a suggestion that Christmas is somewhat magical to Harry himself as, in his life prior to the events of the first book, he’s never really gotten presents (or, quite, frankly, had much to celebrate). Christmas in the series becomes emblematic of family as Harry grows closer to Hermione, Ron, and the rest of the Weasley family. The books don’t delve into any larger issues with Christmas (there’s never a suggestion that, for example, Father Christmas is a real wizard), but its role in each book and the suggestion that, at the very least, it is special to Harry, adds extra weight to our feeling that Christmas is a fantasy staple. As an added bonus, check out Litreactor’s Advent Calendar of Fantasy Fiction, where they recommend a different holiday fantasy story for each day of December.